Want the Best App for Your Daily Commute? Take a Public Bus. I take buses and trains everywhere in the San Francisco area, and I know the city’s bus routes better than I know the UX on my phone. So I had to try Leap, the city’s new private bus service. It was a nice experience in many ways, but I wouldn’t recommend it – and not just because of the $6 price tag. When I amble around the corner in the morning to grab a cup of coffee in my neighborhood, I pass two public bus stops. They’re serviced by the city’s MUNI buses, but also by buses from Google, Apple, Facebook, eBay, Genentech, and a few other rando companies. Basically, I live at Ground Zero of the San Francisco bus wars. But honestly? I feel like the more buses, the better. I’d rather have Googlers riding the bus to work than generating more carbon emissions with all those cars stashed under Google’s parking lot solar farms. So even though I had already heard terrible things about Leap, including their policy of not allowing disabled people and children on their buses, I had an open mind. I headed downtown, to catch the evening Leap bus into the Marina. The service is only about a month old, definitely in beta, and so they only have this one route between San Francisco’s rich bayside neighborhood and the financial district downtown. And yeah, it’s expensive – to sign up for the service, you pre-pay for 3 of those $6 rides, with coffee and snacks costing extra. “What? They make you take it? That seems really unfair.” With that, he wished me luck, closed the door on all those empty seats, and drove away. The Leap bus was just as empty as the Presidio shuttle, but its faux wood interior was suffused with lavender light from recessed LEDs edging the ceiling. It was piloted by a preternaturally charming woman who said “happy Friday!” as if she really meant it. Another woman was working behind the café counter, and helped me figure out how to make the QR code on my phone work with their app so I could pay for admission. She sold me a five dollar bottle of iced coffee, and told me that she’d never seen the bus more than half full – which is understandable, given that it’s still in beta. Only one other passenger joined us on the trip from downtown to the Marina, and it gave the whole ride a kind of retail space void feeling, like a Gap store crossed with that weird Phantom Zone prison where they stuck Zod in the 1978 Superman movie. There was free wifi, which wasn’t super fast, but it did allow me to jump into Slack and have a meeting with my coworker Sarah. I typed to her about story ideas, and took notes on my bus experience in a text editor, which in a sense made me the ideal audience for this kind of thing. Here I was, a techie professional, taking the goddamn techie bus. But the thing is, it wasn’t much of a techie bus. First, it didn’t even have an Android app – to buy my coffee, I had to borrow the iPhone app of the woman working behind the counter. More importantly, Leap’s mobile site didn’t tell me when the next bus would be coming. Sure, Leap promises that they will come every 15 minutes during the hours when they run. But I couldn’t time my arrival at the bus stop because Leap wouldn’t tell me when the bus was coming. The teeny blue bus icon didn’t even show up on their real-time map until it was about a block away from my stop. This wouldn’t seem like such an affront if it weren’t for the fact that San Francisco’s public transit system uses an app called NextBus which is actually ridiculously helpful. It geolocates you, and gives you a list of arrival times for all the buses in your immediate area. NextBus — which operates in a ton of cities across the U.S. — means that I never have to stand at a bus stop wondering when my ride is coming. And it’s fantastic for commuting, because I can leave my house at exactly the right moment to catch the bus that picks up on the corner. There’s a side benefit for San Franciscans, too: many of the bus routes in our city are bizarre, serpentine meanders, and NextBus helps you discover hidden stops you didn’t even know about on familiar bus lines. So there were a lot of problems with Leap, including cost and that feeling of being trapped in the Phantom Zone. 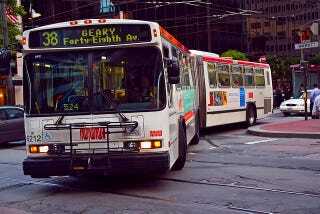 But in the end, Leap just couldn’t compete with MUNI for purely technical reasons. My public transit app has spoiled me for the supposed luxuries of private transit.